Winter mountain safety skills courses for skiers and boarders. The dates and prices are for 2019, but we will run similar courses in January, February, March 2020. Details to follow. I have several 2 and 4 day Scottish Ski-Mountaineering Courses scheduled during winter 2019. 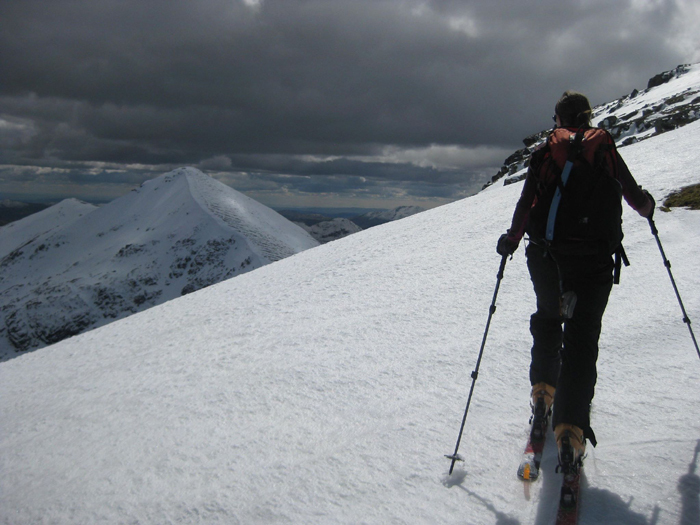 These courses are an introduction to ski-mountaineering for regular skiers. The courses will teach the mountain skills necessary to ski safely over Scotland's munros and will not focus much on skiing skills. They are suitable for any experienced skiers or snowboarders who want to try moving beyond the pistes. While experience of winter hill-walking in Scotland is an advantage it is not necessary to have this beforehand. However minimum skiing ability is essential - you should be able to descend some black runs, and come down red runs in all snow conditions confidently and efficiently. 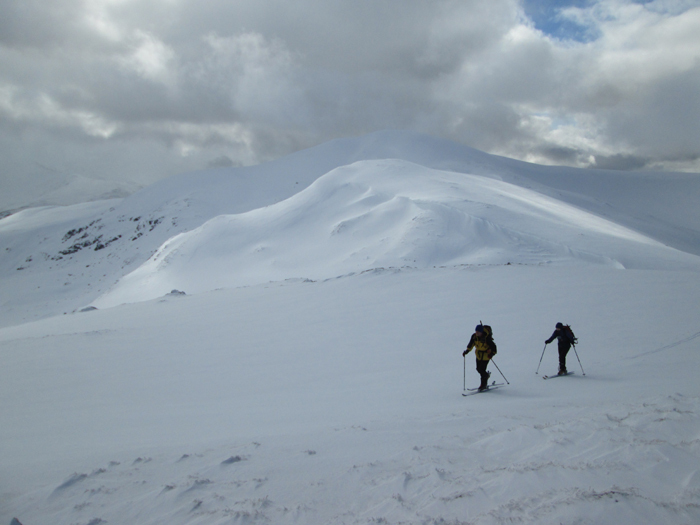 Areas we'll aim to cover whilst skiing over the tops of munros include the following:- route planning, avalanche assessment, navigation on skis, use of ice-axe and crampons, basic ropework and belays. Each course will be kept very flexible to adapt to the needs of the clients who book. We will also have to adapt to the Scottish weather and snow conditions, which can be unpredictable. 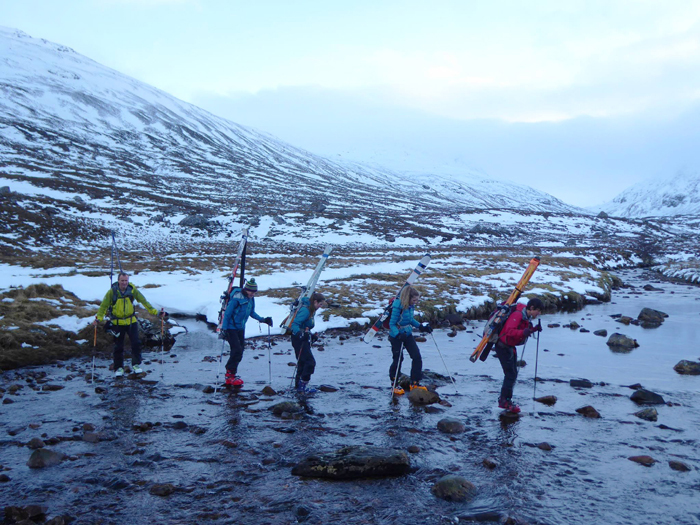 These courses are designed for those with their own ski-mountaineering skis or splitboards, but I can easily help you to hire equipment in the Aviemore area if you need it. Coming back from a good Scottish descent in the Fannaichs, 3rd January 2018. Please note that while these scheduled courses run in the Aviemore area, I can also run courses at other venues to suit. Other good options include the Glenshee and Ben Lawers areas in Perthshire and the Fort William area in Lochaber. Skiing down Stob Coire Sgriodain, Scottish Highlands, April 2016. Skiing the NE ridge of Ben Nevis, May 2015. We normally use the wee town of Aviemore in the Scottish highlands as a base for these courses. There are various accommodation options in this area, including hostels, B&B and *** and **** hotels. I can help with arranging accommodation once you have booked a place on one of these courses. Travel to this area is easiest done by car from most of Scotland or northern England. From further afield it is possible to arrive by train or fly into Inverness airport and rent a car (or we may be able to pick you up there). If you want advice on travel and accommodation options before booking please ask! Ski or snowboard equipment can be rented in Aviemore if you don't have your own. Our price doesn't include your accommodation and travel to the area, or ski hire, but we can help you arrange these. 2-day course -- £165 per person. 4-day course fee -- £315 per person. We generally need a minimum of two bookings to run these courses, there will be a maximum of four on the courses. Private guiding is also available for groups or individuals. 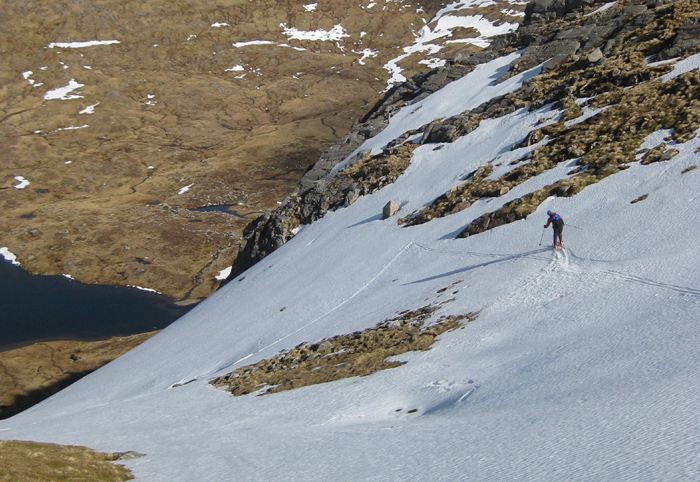 Skiing in the hills above Glen Lyon, March 2014. Skinning up towards the summit of Ben More, May 2015. The peak in the background is Stob Binnien, with the very nice NE face descent on the left. Ski-mountaineering is an adventurous activity and all clients will be exposed to an element of risk by taking part in this course. While we take all reasonable precautions to reduce risk it is neither possible nor desirable to completely eliminate these additional risks. Some of these hazards carry the risk of serious injury or death. It is important that you understand the risks involved before signing our booking form. We have identified the following areas as the principal additional risks of this itinerary. This is not a fully inclusive list - please ask if you would like to see our more detailed risk assessment for this course before booking. Mountain & Skiing Hazards : In certain places you may be subjected to a risk of rockfall. There are risks of injury from skiing falls and from slipping and sliding on snow.